This study addresses the question, are there leading indicators in the determination of successful Greenfield Seaport investment in Developing Nations? The findings show that there are several factors which would appear indicative of successful investment or at a minimum the creation of a climate which makes it attractive for investment in the Greenfield port sector. 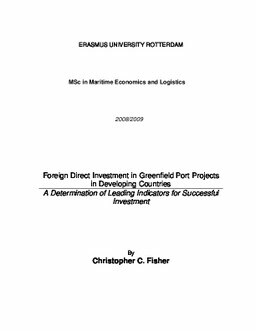 Among the most significant findings of this study include the determination that the most significant impact on the viability of Greenfield seaport investment is the particular host nations’ ability to facilitate business as gauged by the Ease of Doing Business rank and the Access to natural resources the country has at it’s disposal. Beyond that, the general ability of a nation to effectively tender Greenfield port projects dramatically increases the likelihood of success Greenfield investment.